A weekly project status report is beneficial to project managers, the project team, the clients of the project, and the suppliers who are required to provide the raw materials and other demands of the project in certain weeks within the duration of the project development and execution. 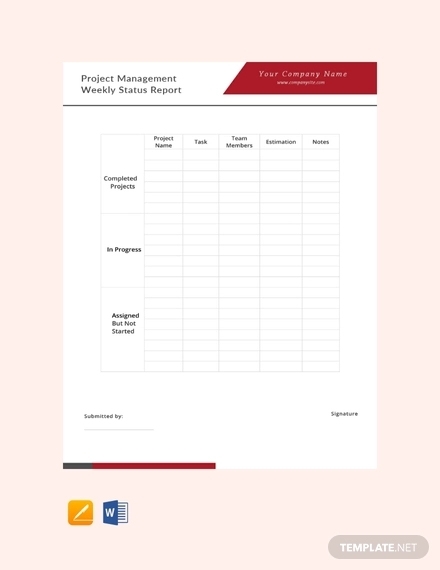 Free report examples that are used to record and present the weekly status of projects can make it easier for all project stakeholders to have an idea on whether the project processes are at par with the project’s timeline and standards of quality. 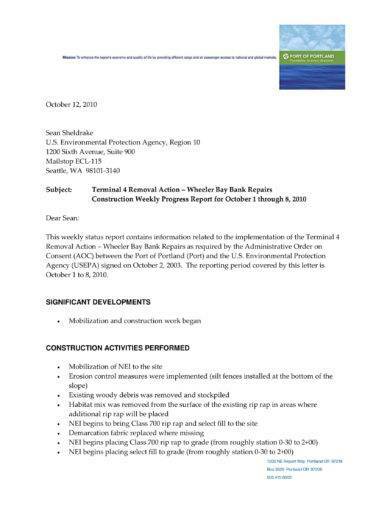 If you will create a weekly project status report, we suggest you to refer to downloadable examples and templates. These references can help you not only with the formatting of the document but also with the proper identification of the weekly project status report’s appropriate content. Make sure to browse through our downloadable examples list and use any of them as your document guide. 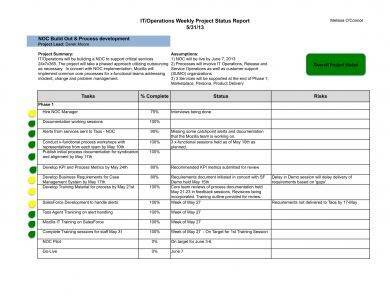 What Can Weekly Project Status Reports Contribute to Project Development? 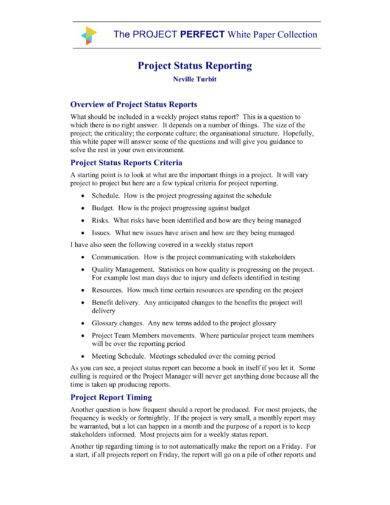 There are several factors that are essential to be considered when creating a weekly project status report. Once all information regarding plans and process execution are aligned; evaluated and polished, it will be easier for all entities involved in the project to provide their deliverable and be of help with regards the achievement of project objectives. You may also see investigation report samples and examples. A weekly project status report can define constraints that are faced by the project team especially those that are related to project schedule, budget, workforce, and other deliverable. This can help the stakeholders to come up with simple plans that can ensure that the entirety of the project scope will not be affected by threats and other concerns. A weekly project status report promotes a step-by-step and continuous manner of understanding not only the project’s current status but also the required changes when it comes to its needs and demands. This way, the objectives for the reporting on the next week period can be specified varying on the successes and failures of the current week. 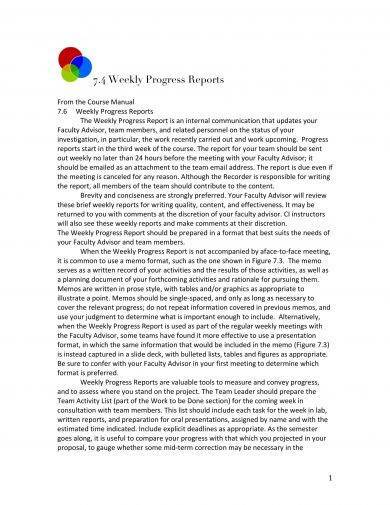 You may also like report writing examples. A weekly project status report can discuss all the weekly accomplishments of the project team. These successes can then be assessed depending on the metrics or measures that have been set prior to the project’s process executive. These details can also be used as references whenever there is a need to evaluate the level of development that has already occurred from the beginning of the project up to the current period where the project is at. You may also check out business report examples. 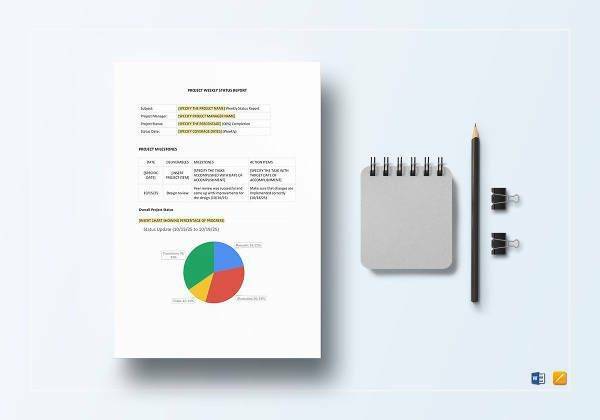 Different types of project report examples are created to ensure that all stakeholders are in the same page when it comes to the project’s current condition as well as the next steps that are expected to be done by the project team. With this, further understanding can be developed among all the entities involved in the project. A weekly project status report is one of the project reports that are made to present information about the weekly updates not only about the general status of the project itself but also of the project team, the suppliers of the project, the condition of the project stocks and inventory, and the necessary call to actions that must be done to face project constraints in an effective way. You may also see examples of short report. If you will create a weekly project status report, the project team can present the potential risks that can affect the project and its development. These risks include a list of challenges and issues that the project team and other entities within the project must prepare for so that impacts can be minimized or even be eliminated. Hence, there can be development steps that can be altered when necessary while still thinking of the actual results that the stakeholders of the project are expecting. Coming up with a comprehensive weekly project status report can minimize and designate the evaluation scope of the project. Since you are working on a weekly reporting basis, it will be easier to identify the weak areas of the project. Having these information at hand can further strengthen the dynamics, efficiency, productivity, and effectiveness of the project team. You may also like service report examples. Moreover, a weekly project status report can also increase the morale of the project team as it provides information about the strong spots of the project and the actual improvement of the project when compared to its status during the previous week. 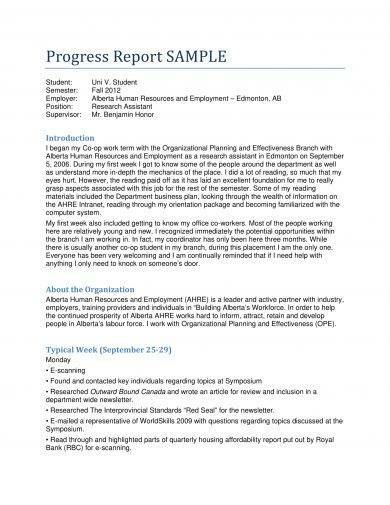 You may also check out management report examples. The weekly project status report that you will make must be aligned with the actual needs and condition of the project. It is important for all details to be accurate and precise as the content of this report will be the basis of the next decision pertaining to the project’s development. You may also see marketing report examples. Make sure that you will gather credible and firsthand information. There should be point persons that can supply you with the information that you need. As an example, you must have a person from the project team that will take care of the inventory of all the raw materials of the project. Asking any people about the current project stock supply can lead you to listing down vague answers and undependable reports. You may also like medical report examples & samples. 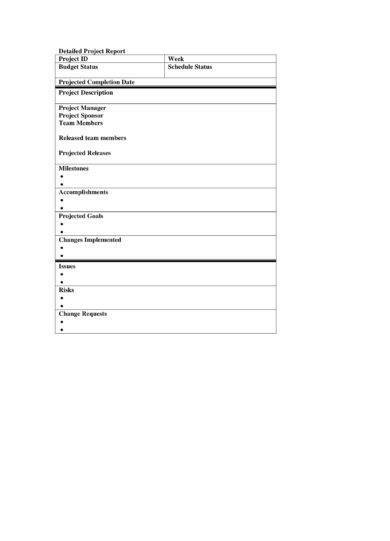 Outline the content of the weekly project status report unless there is a specific template that is given either by the project head or the client. It is essential for the details of this document to be presented in an organized and understandable manner so that concerns can be seen right away. Summarizing your findings can also make it easier to have an overview of the project condition. 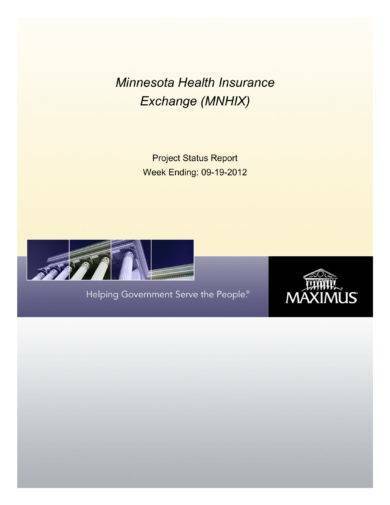 You may also check out quality report examples. Should requests for a more thorough discussion be made, ensure that you have all the documents that you need for the presentation. 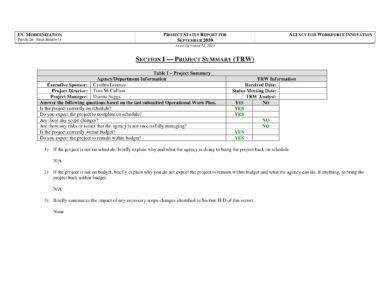 Refer to progress report examples that are used in the same manner that you plan to use your weekly project status report. This can result to lesser to no possibilities of using misleading information as your actual guide. 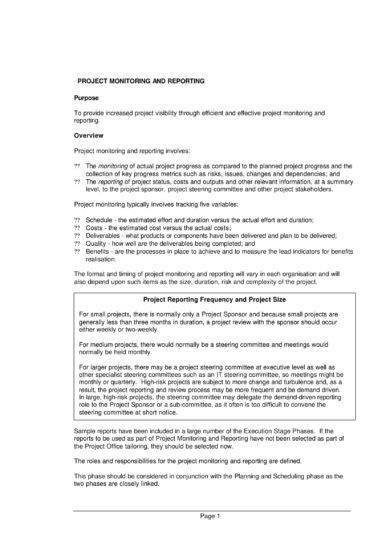 Ensure that you will alter the details listed in the existing weekly project status report example. 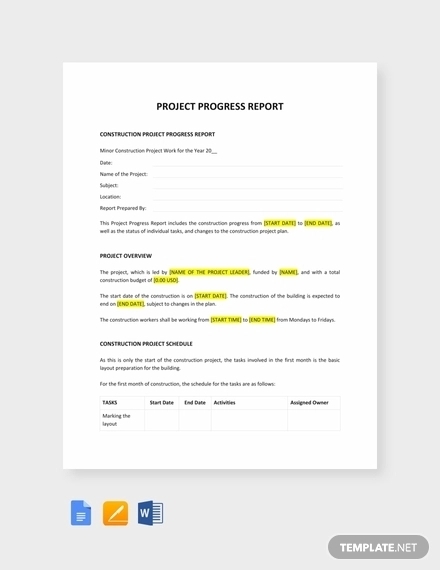 Tweak some information that you think can make the document become more applicable to the project where you will use the report. Again, examples are only guides and are not always recommended to be used as is. 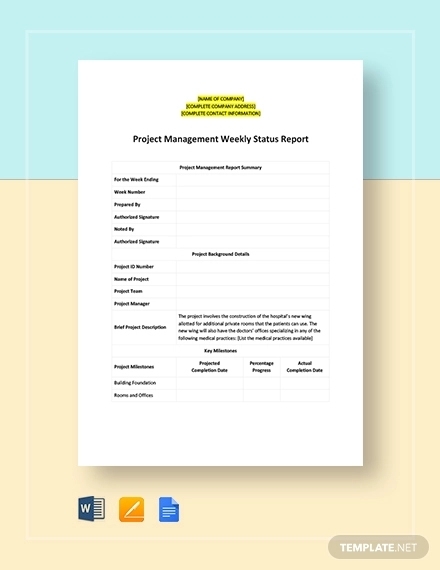 Look at the format of the weekly project status report example that you will use. Ensure that the layout of the document can house all the information that you would like to present to the project’s stakeholders. You also have to be comfortable in using the format that you have selected so you can minimize input errors. You may also see book report examples & samples. Make sure to think of these factors first before picking and downloading the references that you will use as your actual guides. In this manner, having these documents at hand can be more efficient and beneficial for you, for the clients, and for the entire project team. You may also like how to write a short report.